From the opening moments of the welcome reception to the final musical notes of the feature presentation, the 96th Annual Agudath Israel of America event was a historic evening, one that seamlessly blended a rich history dating back nearly a century with the promise of a future filled with an unwavering commitment to Torah values and ideals. 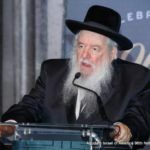 Over 1,800 people turned out at the Hilton New York to take part in A Movement In Time, an unprecedented event embodying the true spirit of the Agudah and its mission to continuously rise to the challenges facing Klal Yisroel in every generation. 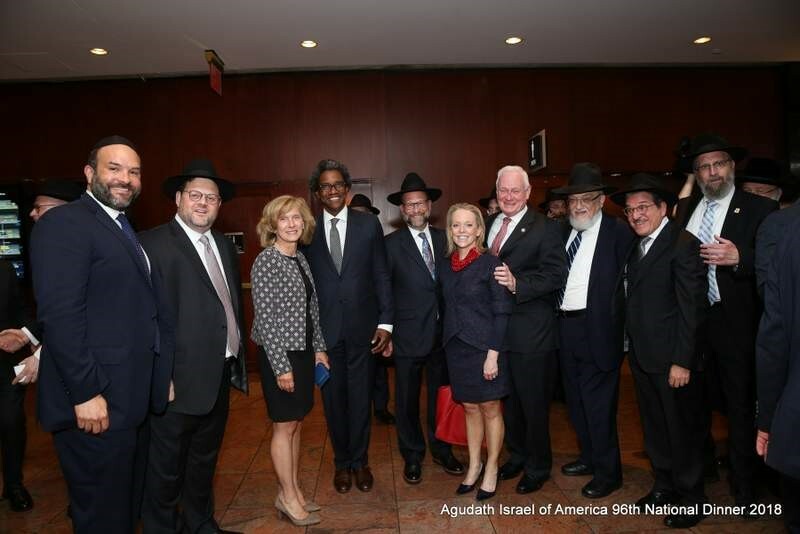 Guests of every age demonstrated their support by taking part in the dinner, opening with a Unity Reception whose exhibits bore testament to the successes of the Agudah’s many community service programs. 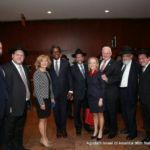 Among those who participated in the celebration of the Agudah’s accomplishments were well over two dozen elected officials, judges and dignitaries. 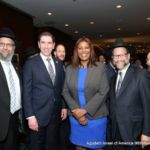 Representatives comprised of administration, staff and board members of close to 50 yeshivas came to demonstrate their gratitude to the Agudah for its continued advocacy on their behalf. 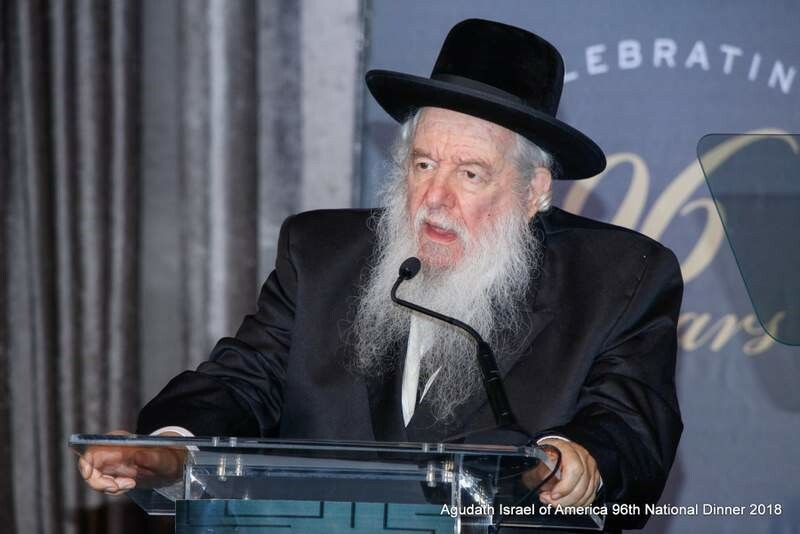 Guest of honor Shlomo Werdiger, chairman of the Agudah’s board of trustees, was lauded throughout the night for his exemplary philanthropy and relentless efforts that have yielded tremendously beneficial results for the Torah community. Heralded as a role model who shuns the spotlight, Mr. Werdiger was described by numerous speakers as a legendary askan whose capacity for giving is endless. 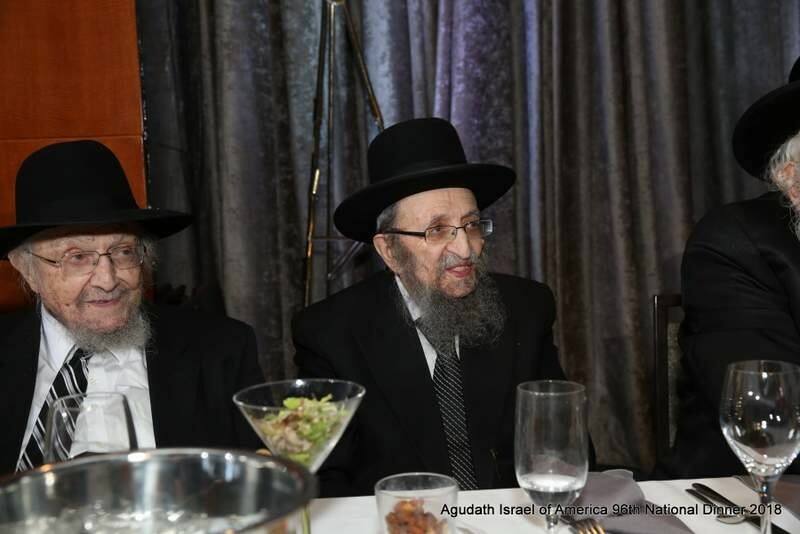 After being gifted with a painting of himself with the late Agudah president Rabbi Moshe Sherer z’l, Mr. Werdiger spoke of the importance of every individual recognizing their own ability to make a difference in the lives of others. 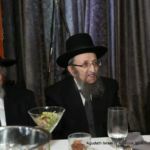 Emotional tributes were paid to the memory of Mendy Klein z”l who was due to be honored at the dinner with the National Leadership Award but passed away unexpectedly just weeks ago. 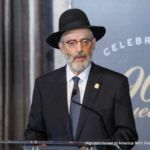 Rabbi Shmuel Kamenetsky, Rosh HaYeshiva, Talmudical Yeshiva of Philadelphia and member of the Moetzes Gedolei HaTorah, spoke of Mr. Klein’s passion for seeing to the needs of others. 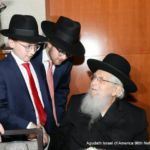 Rabbi Elya Brudny, Rosh Yeshiva, Mirrer Yeshiva, praised the exceptional humility that had Mr. Klein refusing to accept thanks for his significant financial donations to many an institution or cause. There was also a poignant memorial video, in which several of the Klein children described the scope of their father’s tzedakah activities. Yoni Klein, his son, spoke movingly about his father’s legacy. 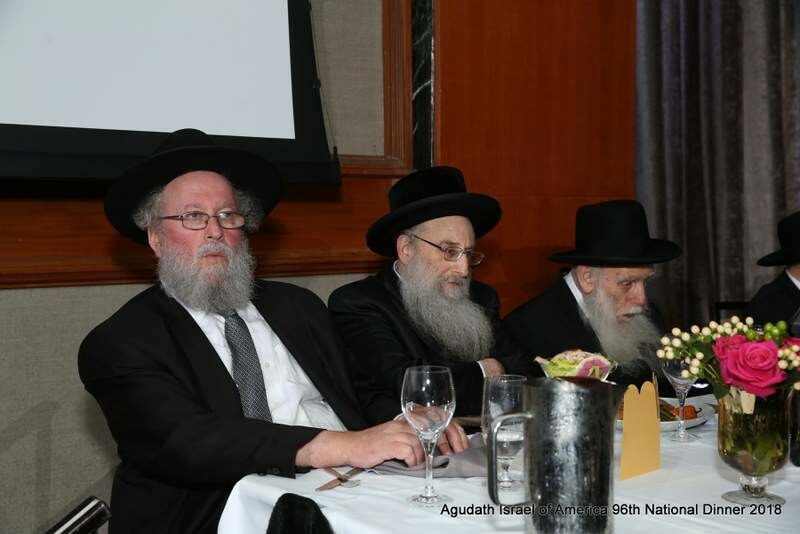 The recent loss of Rabbi Simcha Bunim Ehrenfeld z’l, Matersdorfer Rebbe and member of the Moetzes Gedolei HaTorah, and Rabbi Zecharia Gelley z’l, mara d’asra, Khal Adath Jeshurun and member of the Nesius of Agudath Israel, was keenly felt. They were remembered as true Gedolei Torah whose staunch dedication to the Agudah knew no bounds. Mrs. Aliza Grund a’h, long-time president of Nshei Agudath Israel of America, was also warmly recalled for her many activities on behalf of the community. 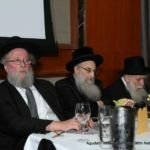 The theme A Movement In Time was echoed by multiple speakers who recounted the Agudah’s success in perpetuating its ideals in numerous ways throughout the years, shifting its focus and creating new initiatives as Klal Yisroel’s needs continue to evolve. 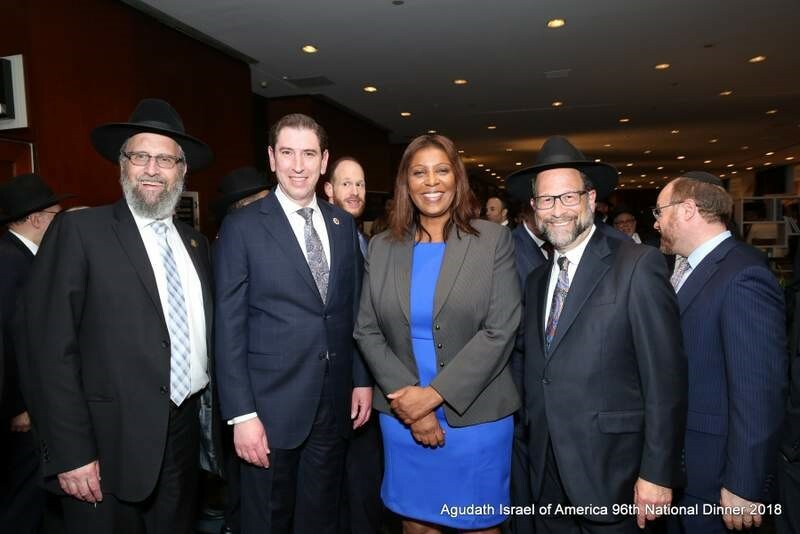 Also emphasized throughout the program was the changing face of the Agudah, whose seasoned members have seen an influx of fresh younger faces who are eager to become involved in the movement that has bettered the lives of innumerable members of the Jewish community. 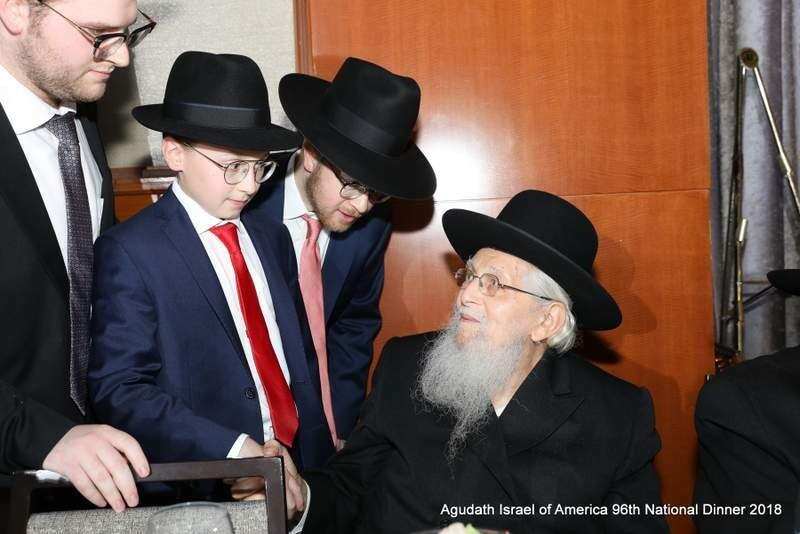 As one of the Agudah “ambassadors” representing the next generation of askanus throughout North America said, he became involved after realizing the many ways that the Agudah touches the lives of the Torah community through its extensive network of programs. 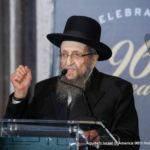 The dinner program included uplifting words from the Rosh Agudas Yisroel and Novominsker Rebbe, Rabbi Yaakov Perlow, and inspiring divrei chizuk from Rabbi Shmuel Kamenetsky. 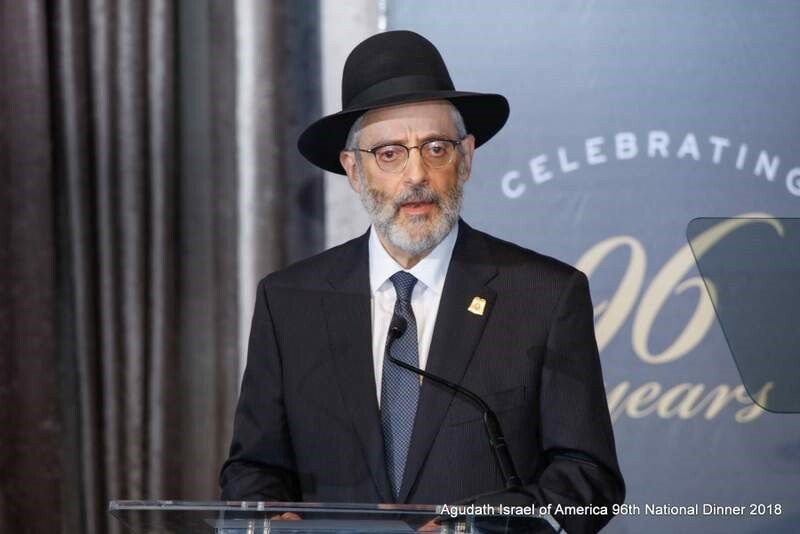 Rabbi Chaim Dovid Zwiebel, the Agudah’s executive vice president, explained that far from being just an organization, the Agudah is a movement whose very existence is dedicated to meeting the challenges of the Torah community in past times, in our time and in future times. NY Senate Majority leader John Flanagan addressed the event. 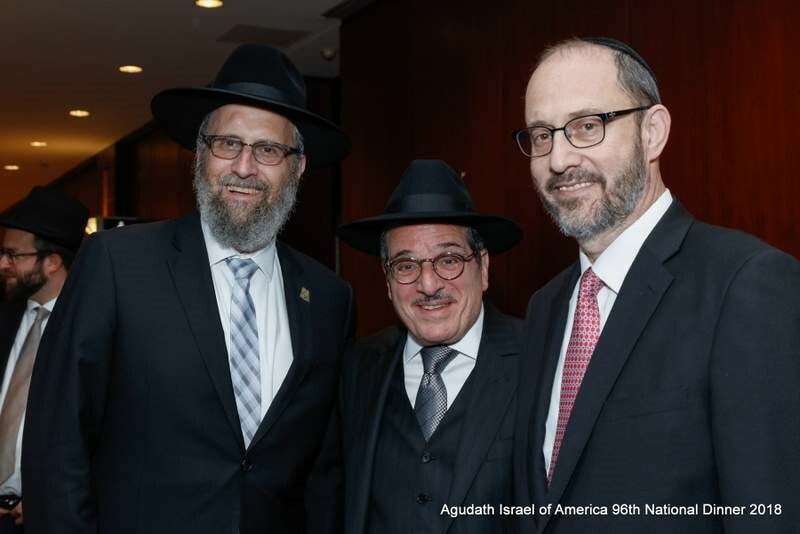 He praised both the Agudah and its chairman, Mr. Werdiger, describing the satisfaction he gains by working together with the Agudah and the Orthodox Jewish community, building upon shared values. 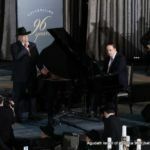 Israel’s President Reuven Rivlin and Senator Charles Schumer shared their support of the Agudah from afar in a pre-recorded video. 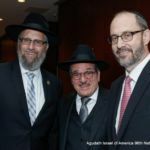 Event chairman Gary Torgow, delivered a “State of the Union” address in which he enumerated many of the Agudah’s activities, dramatically highlighting several members of the audience who had received critical services from the Agudah’s various divisions. 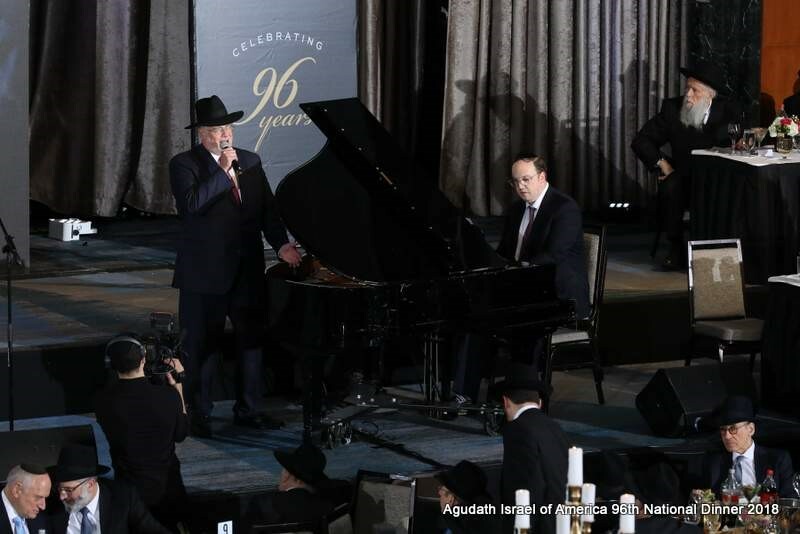 The evening concluded with a musical tribute to Mr. Werdiger, with a poignant song performed by Rivie Schwebel, a member of the Agudah’s board of trustees. The feature presentation, A Movement In Time music video, illustrated the message of the evening, that much like an orchestra can only achieve true beauty when its many components work in tandem, the Agudah’s accomplishments are the result of the combined efforts of the many individuals who use their own talents to contribute to Klal Yisroel. 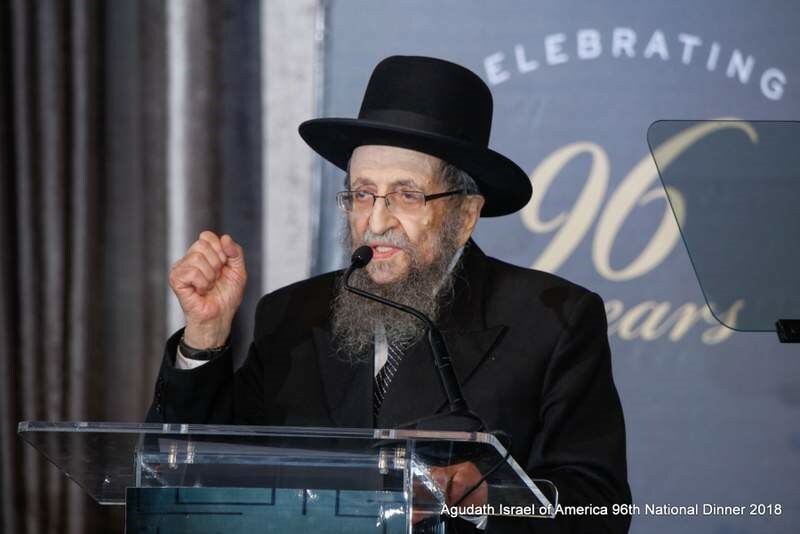 The final words of the night were delivered by Mr. Werdiger, who described the Agudah as the guiding light that has helped the Torah community navigate its way through the ever-changing maze of life.